(Reuters) - Food prices are likely to become more volatile in coming years, increasing the risk that more poor people in import-dependent countries will go hungry, the United Nations said in an annual report on food insecurity published on Monday. Global food price indices hit record highs in February and were a factor in the Arab Spring of unrest in north Africa and the Middle East. Prices have since eased but the U.N. report said economic uncertainty, low cereal reserves, closer links between energy and agriculture markets and rising risks of weather shocks were likely to cause more dramatic price swings in the future. 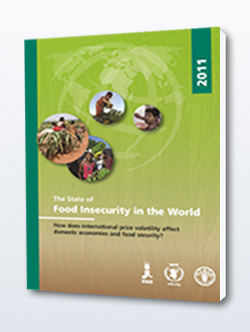 "Food price volatility featuring high prices is likely to continue and possibly increase," the Food and Agriculture Organization, the World Food Program and the International Fund for Agricultural Development said in the joint report. "Demand from consumers in rapidly growing economies will increase, population continues to grow, and further growth in biofuels (displacing food crops) will place additional demands on the food system." The report said that poor farmers and consumers in small importer countries, particularly in Africa, would be more vulnerable to shortages as a result. It said short-term price swings had long-term impacts on development, depriving young children in vulnerable areas of key nutrients, which permanently cut their future earning capacity and increased the likelihood that they would remain poor. The report found that many countries in Africa and other import-dependent regions continued to suffer problems caused by the world food and economic crises of 2006-2008. And it said crises such as the current famine in the Horn of Africa were challenging the U.N. goal of cutting the number of people suffering hunger to roughly 600 million people by 2015, compared to 1.02 billion in 2009. In 2010, the United Nations said the number had fallen for the first time in 15 years, to 925 million. But it did not update the annual figure in the latest report, saying it was reviewing its methodology and wanted to start providing more timely updates. Safety nets such as food aid are crucial to tackling the problem, coupled with long-term investment in agriculture and improving resilience for farmers, it said. Developing better irrigation, land management and seeds would all help to reduce production risks and mitigate price volatility, it added. The report concluded that predictable policies and openness to trade were more effective strategies for governments than export bans and other restrictive policies, which risk increasing volatility and high prices on international markets.